MSC Cruises Renaissance program is continuing with the MSC Armonia upgrade, refurbishment and an enlargement to the hull. The MSC Armonia is the first of four vessels to receive MSC’s Renaissance upgrade. On Sunday 31st August the ship arrived at the Fincantieri shipyard in Palermo, Sicily, Italy to begin its refit. The drydock will take 11 weeks and will include upgrades on all areas of the ship. Before MSC Armonia’s arrival on Sunday, Fincantieri had begun preparations for the massive project both on board and in the shipyard. 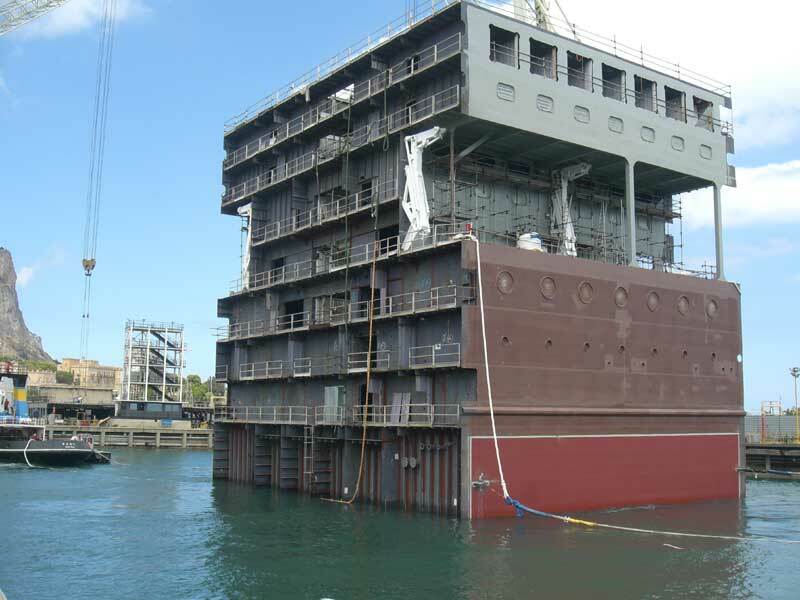 On 28 August, the new mid-ship section was floated into the shipyard, and towed into the drydock area, where MSC Armonia will undergo her Renaissance. Finally, on Sunday morning, MSC Armonia stopped inside the drydock, where the mid-ship section was waiting. Work immediately started on her hull, as the cutting line was marked. The midsection will be inserted mid-September and the maiden journey out of the shipyard will be on 17 November. One of the largest parts of the refit is the new block that will be added in the middle of the ship. The block will extend the ship by 24-meters and will include 193 extra cabins which were already to place before Armonia entered drydock. In addition the large block added to the middle of the ship there will be loads of new onboard features and improvements. There will be new onboard clubs for all kids from babies to teenagers as well as a new spray park on the open deck which kids and adults can enjoy. The restaurant will be refurbished and extended which will offer guests an even better experience. A new onboard Library is to be installed during the drydock along with upgrades to the Aurea Spa. Once the MSC Armonia has completed its Renaissance upgrade it will be 65,000 tons, will be able to carry 2,680 passengers and will be 275 meters long. The vessel which is currently 60,000 tons will re-enter service on November 17th 2014 with a one-off inaugural Mediterranean cruise from Genoa to the Canary Islands. The other three ships in the same class will also be getting the Renaissance program upgrade. MSC Sinfonia on 12 January to 16 March 2015, MSC Opera on 2 May to 4 July 2015 and MSC Lirica on 31 August to 9 November 2015.